Here are 7 of my readers’ houses that are on the market right now. Check ’em out! #1. Linda’s “Copacetic Estate” on Captiva Island in Florida: Listing. #2. A Luxury Log Cabin on 20 Acres in Tennessee: Listing. #3. Carla’s Mid-Century Rambler in Washington: Listing. #4. Becki’s Traditional Two-Story in Ohio: Listing. #5. Bryce’s California Ranch: Listing. #6. Tracy’s Craftsman Bungalow in Alabama: Listing. #7. 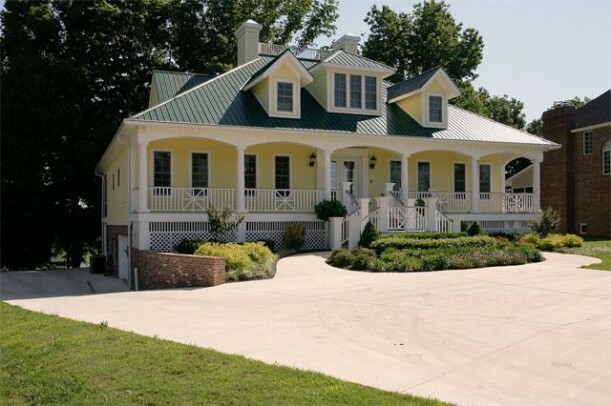 A Lovely Lake House in Tennessee: Listing. Love these listings! Especially the Captiva home! Another Sunday of great homes! I love them all, and two thumbs up to the great photos of each of the houses! There is something about the WA. house that calls to me. I can’t even put my finger on it, but I think it just looks like comfort, ease of living, and from what I can tell, a very pretty area. Actually I wouldn’t turn down any one of them! Love seeing this array of homes from all over this country! I love this series, Julia, seeing what is available all over! Of course I would love to live on Captiva Island!! I will check every single one of these house. I hope you’re having a great weekend and have a very blessed week! Such great houses! I especially loved seeing the one on Captiva. We drove the length of Captiva Island this spring. There are SO MANY homes for sale!!! I only wish I was in a position to buy such a place. It was sad to see how the recession must have really hit places like Captiva extremely hard. Carla’s house is right near where I live. How crazy. I love the last house. It’s one of those places I would love to live in if I had the money. Thankyou for sharing all of these homes with us. I hope they all sell. Thanks so much for featuring my house, Julia!!! This is such a fun blog series! I will get to the houses, Julia, but first I’ve got to say that your new picture is GORGEOUS! Absolutely gorg! Love the Alabama Craftsman house. The typos in the Captiva listing make my teeth ache. Someone needs to clean it up — I know it doesn’t affect the quality or value of the house, but it speaks to a total lack of care in the listing which makes me wonder about what other things are missing. I really like all of these listings Julia. certainly wouldn’t turn my nose up at the Copacetic estate, but I think the Luxury Log Cabin looks so romantic, and my hubby would adore it. It’d be his dream house really, especially with all that storage space. OMG that log cabin is like my cozy dream!! The Alabama bungalow is gorgeous, wish I could move there! I can’t believe the price, seems very affordable-but I know that houses in Alabama are much lower than other places – which is great! This is a wonderful series; I really enjoy what you are doing & all of these homes are beautiful! Thanks so much for featuring my house!! It’s always interesting to look at listings in other locations. I grew up in California and relocated elsewhere, so I’m very aware of how expensive real estate is in that over-taxed state. One reason I moved was knowing I would not be able to live close to the ocean like my parent’s nor would I be able to afford what their generation was able too and they were hard working people, but not wealthy. They also didn’t live beyond their means. Ranch home, cottages and bungalows have always held a special place in my heart. I like these listings, but am especially drawn to the ranch homes. Thanks for featuring them.